This premium WordPress theme covers all you need for a legal business website, service area, quotes and team members pages. Simple to use, this theme is completely responsive and is built with semantic HTML5/CSS3. 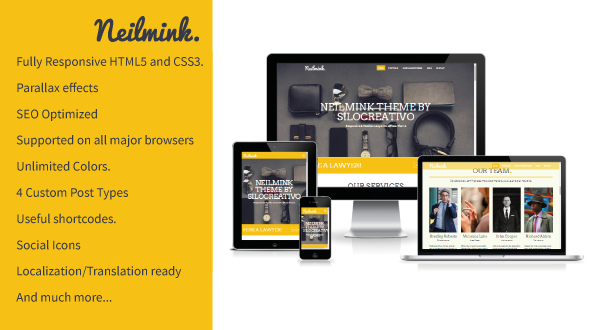 Neilmink includes lots of advanced options like parallax effects, SEO Optimized, Custom Post types, Masonry blog layout… Of course, this WordPress theme can be used for any other purpose: It’s designed in corporate style suitable for any corporation or business. Whether you are a profesional attorneys or not, this WordPress template includes all features you need to present, promote and sell your services. It’s built to be customisable to exact requirements. Enjoy it! v1.6 – 17 May 2016 – Updated version. v1.5.1 – 29 Mar 2016 – Updated version. v1.5 – 28 Jul 2015 – Updated version. v1.4 – 09 Jun 2015 – Updated version. v1.3 – 29 Apr 2015 – Updated version. v1.2 – 12 Feb 2015 – Updated version. v1.1 – 28 Dec 2014 – Updated version. v1.0 – 21 May 2014 – Initial version.